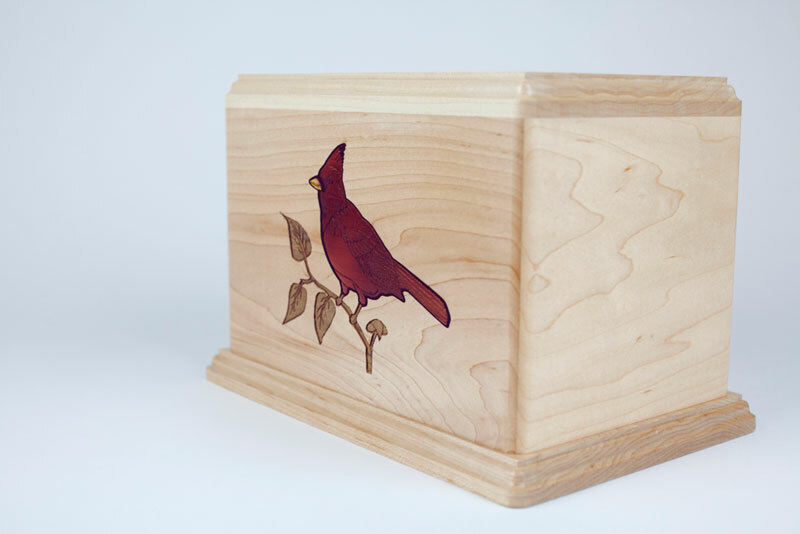 For bird watchers, nature lovers, or fans of various sports teams, the Cardinal Cremation Urn is an heirloom-quality memorial urn which will suit your family’s needs and provide a fitting symbol of their life and passions. 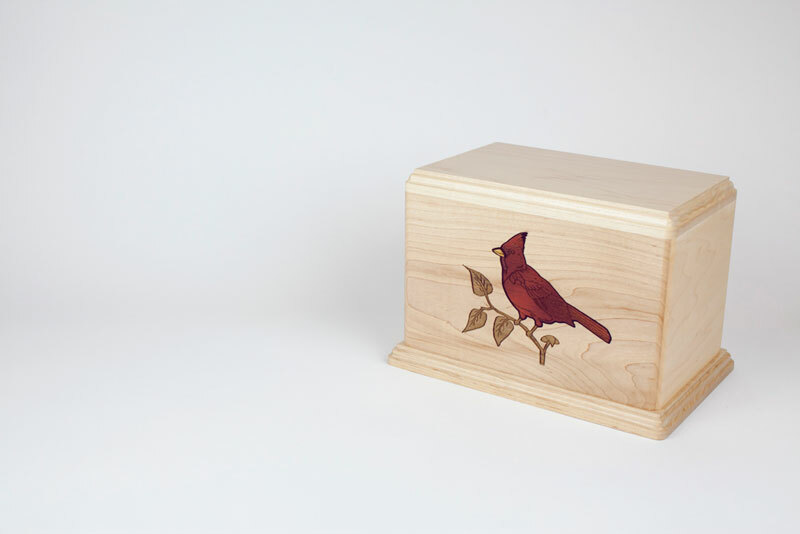 This wood funeral urn features wooden cardinal bird inlay art which is laser engraved in fine detail from rosewood, walnut, and oak, then set into the front of a gorgeous walnut wood cremation urn. 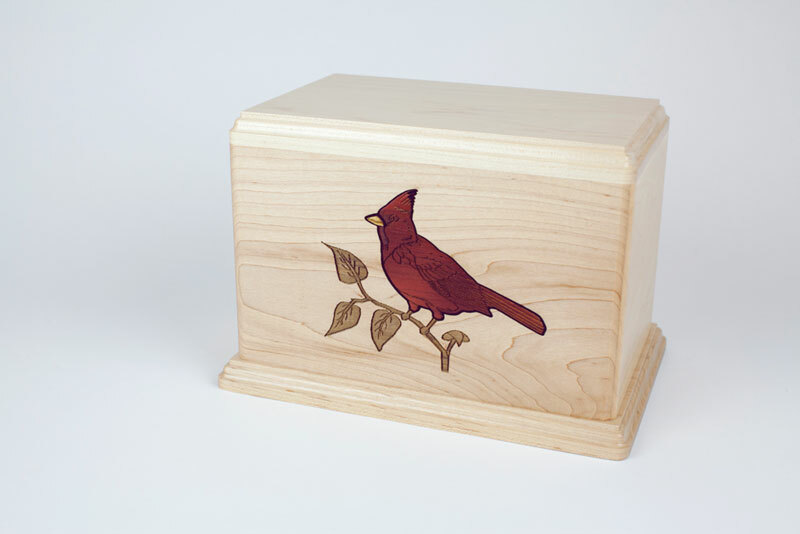 Each memorial is crafted in an Oregon woodshop from premium solid white maple wood, with hearty 3/4″ thickness all around, a sturdy base which removes to provide access to the inside of the urn, beveled edges, and the lovely cardinal inlay art design. The wildlife bird scene depicts a red cardinal (stained rosewood), complete with a bright yellow beak (a tiny inlay of oak wood), sitting on a leafy branch (brown walnut wood). Each element is laser engraved to provide a sense of richly detailed and lifelike realism. 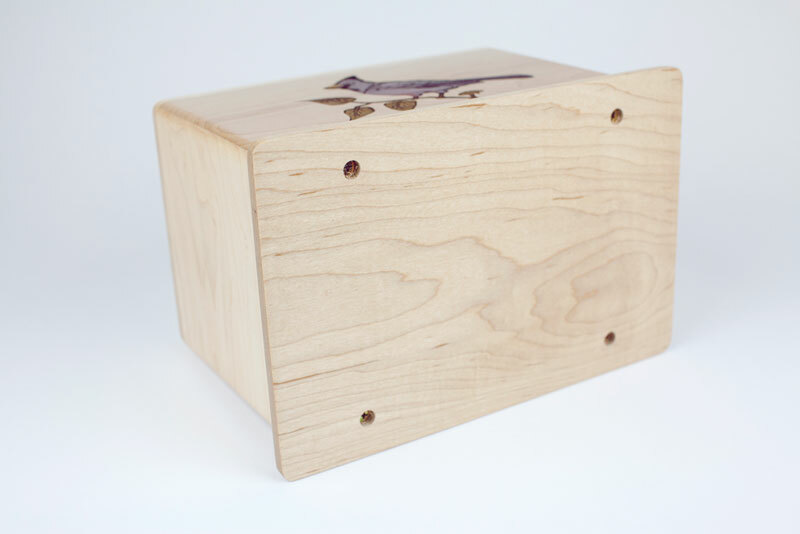 Optionally, we can engrave the top or back of the urn with an inscription of name and dates, which we will laser etch directly into the wood surface of the cardinal cremation urn. 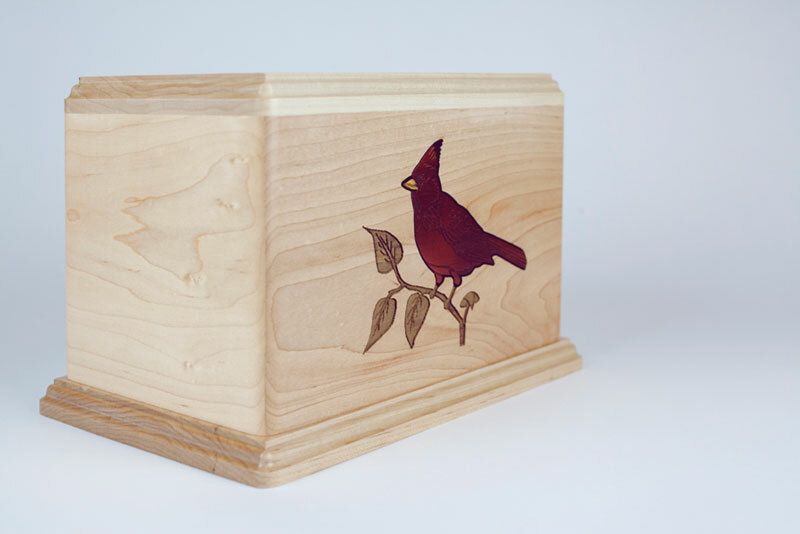 The Cardinal Cremation Urn is crafted with exterior dimensions of 10.5″ wide by 7″ deep by 7.5″ high. This urn has an industry-standard 200 cubic inch capacity, which will hold the cremated remains of a person who weighed roughly up to 200 lbs. For more detailed information on calculating how much what size urn you’ll need, see here. For examples of how these wooden urns are opened and filled, see our collection of videos here. 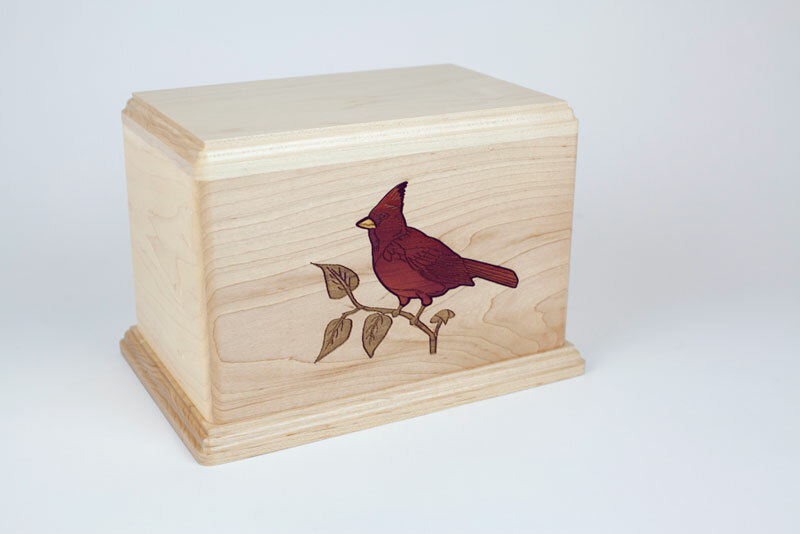 Since this cardinal urn is made from natural materials, the grain pattern and specific hue of the woods used will vary with each piece. This is a desireable effect of using real wood, ensuring that your loved one receives a completely unique memorial urn. 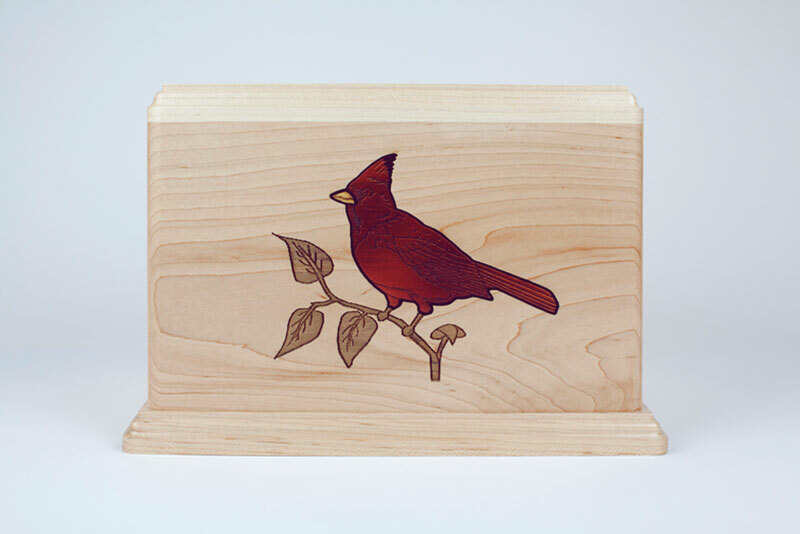 The Cardinal Cremation Urn is just one of many premium wood cremation urns available from Urns Northwest.